Aging: 21 months new and used French Oak. 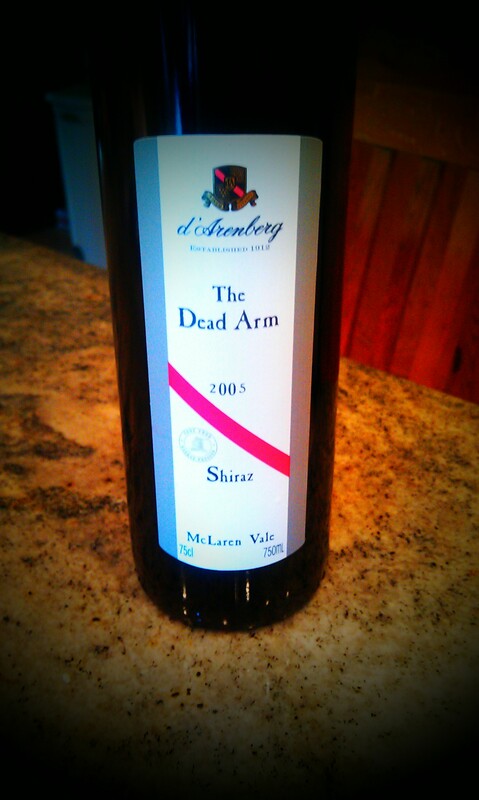 If you haven’t heard of d’Arenberg, then you are missing out on some of the best Australian wine available. 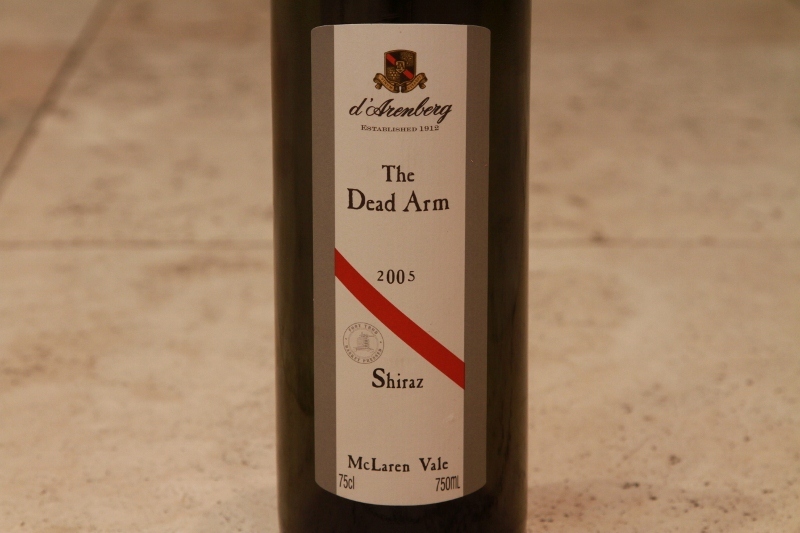 d’Arenberg was founded in 1912, and is one of Australia’s most renowned producers. The Dead Arm is their flagship wine. The name Dead Arm actually comes from a fungal disease that effects vines all over the world. The disease effects one half of the wine, basically reducing it to dead wood, The Dead Arm is that side of the vine. Most vineyards dig up these vines and start over. However d’Arenberg decided to harvest the fruit left on the other side, the side not destroyed. The vines are very low yield and the fruit is tiny and super concentrated. The vines are 80-120 years old and the grapes are harvested by hand. The production: open top fermentation, the must is not plunged or pumped while fermentation takes place. Only after primary fermentation is the must pressed, and it is done so in the traditional way; by foot! After foot pressing, the wine is basket pressed and then transferred to oak barrels for over 20 months. Finally each barrel is assessed for its quality and only the best barrels are used to make the wine. The Dead Arm has received a ton of critical acclaim. In fact between 1996 and 2006 Robert Parker awarded this wine four 95 point ratings, three 96 point ratings and one 98 point rating. So how does the 2005 vintage stack up. At this point the only other vintage I have to compare it against is the 2003. I have to say that the ’05 is superior, even though they both received 95 points from Parker. First off the wine is BLACK. and I mean black. There is a fair amount of sediment present, nothing that a bit of decanting or a strainer can’t remedy. I think the prescense of sediment is actually a good thing, a foreshadowing. The nose is intense, full of black fruit, peppery, almost a tar or creosote like burn in the nostrils. Followed by hints of star anise. The palate is explosive. The first sip seemed to excite every single taste bud on my tongue, seemed to electrify my palate. I literally said “WOW!” out loud. Hands down the best Shiraz I’ve ever had. Not that I’ve had thousands, but I’ve been enjoying Australian Shiraz at different price points for over 20 years now and this is the creme de la creme. The palate consists of a subtle sour cherry liqueur which is then vaporized by a dark chocolate pepper and cigar smoke finish. The wine is not sweet, but there is a tiny element of ripe fruit intermingled in the palate. Parker in his review in 2007 said that this wine could benefit from 3-5 years of cellaring. Well it is 2011 now, 4 year later and the wine is still fairly astringent. This becomes noticeable later on after you have had a few glasses. It is such a concentrated powerful wine it almost hurts, almost, but it doesn’t. Another feature that is thankfully absent is the “Aussie fruit bomb” characteristic. It’s not a sweet jammy syrupy wine. It is dry, concentrated, complex and tannic, and extremely well balanced. If you are a pinot noir drinker, this wine will punish you, however if you are a fan of the bigger bolder, and drier wines I think this will be exactly what you are looking for.